I've been leaning on cooking a lot lately. It happens whenever I turn in a draft of my book proposal (for what I hope will become a Bon Appétempt book) and need to wait for feedback. Suddenly, I'm without a major project and feel a strange lack of purpose. What I probably should do is start working on something brand new, but I usually end up flipping through cookbooks, making grocery lists, collecting ingredients, and cooking. Just this week alone (apologies in advance for the potentially braggy nature of this sentence), I've made Heidi Swanson's farro and lentil soup, a Mexican feast reminiscent of my Mexican bibimbap minus the meat, an (improved!) version of this Japanese squash soup, and begun the process of preserving Meyer lemons from our tree. And, get this. Not one of these did I document to share with you. Why? Because I already have a back log of recipes I've been meaning to share with you since before Thanksgiving! 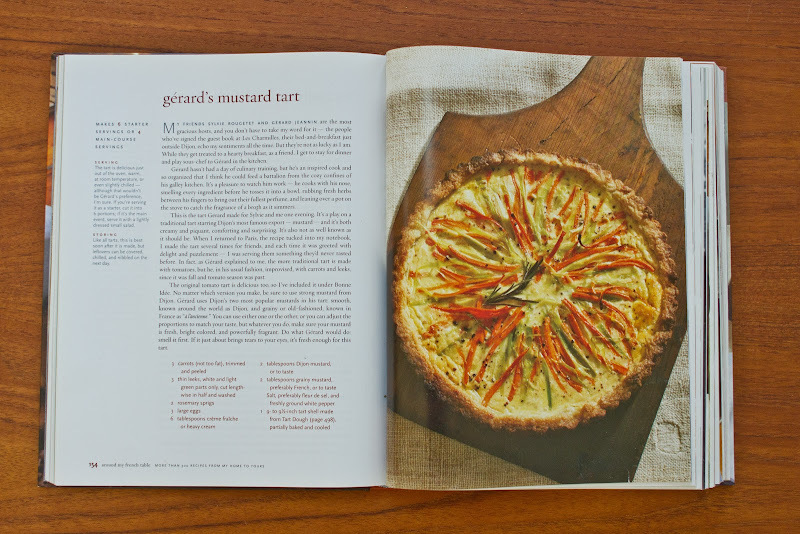 For example, this beautiful mustard tart that I made with help from my friend Rebecca and her copy of Dorie Greenspan's Around my French Table, which I'm still borrowing (Thank you very much!). Here comes the part of the post where I mention a podcast I just listened to: in the This American Life episode, "Mapping," they interview this guy, Toby Lester, who has mapped out all of the ambient sounds in his world to the extent that he can say things like, his office (the combination of the whir of the heater and the fan from his computer) is a minor third and the buzz from the refrigerator in his kitchen is a b-flat. "But what appliances do that I don't think other natural world things have done is provide a steady drone. It's the droning that is really novel. My guess is that people these days find themselves a lot more bored, in general, than they used to be, partly because their appliances are taking care of things for them. But the payoff is that there's this drone behind everything. And the drone is sort of a symptom of modern life. We're very acutely aware of our own boredom, and we've been eased into our boredom by all these machines." As an adult, admitting that you're bored feels wrong. Because how can we be bored when we're so busy?! We all have jobs to report to, dinner parties to throw, puppy kindergarten to attend (Surely, you guys have puppy kindergarten to attend? ), laundry to fold, and hopes and dreams to dream (and potentially inch toward), but if I'm being honest, I've also had time to be bored. To be honest, I've definitely felt this drone Mr. Lester is talking about. At the same time, as I listened to this episode, I was in the middle of chopping, or more precisely, breaking down my kabocha squash, and I was struck by the fact that, despite our many gadgets and appliances, there's a lot of work in the kitchen that cannot be sped up or made easier, and perhaps this is the heart of the reason why cooking has become such a refuge for me. Which brings me to Rebecca's and my afternoon well spent, mixing ingredients for tart dough, waiting for the dough to chill, peeling carrots, cleaning leeks, convincing Mavis that Rebecca was not an archenemy, steaming the carrots and leeks next to a fat rosemary sprig, rolling out the dough, waiting for it to chill, and well, cooking. Note: The dough should chill for at least 3 hours. To make the dough in a food processor: Put the flour, sugar, and salt in the processor and whir a few times to blend. Scatter the bits of butter over the flour and pulse several times, until the butter is coarsely mixed into the flour. Beat the egg with the ice water and pour it into the bowl in 3 small additions, whirring after each one. (Don't overdo it -- the dough shouldn't form a ball or ride on the blade.) You'll have a moist, malleable dough that will hold together when pinched. Turn the dough out onto a work surface, gather it into a ball (if the dough doesn't come together easily, push it, a few spoonfuls at a time, under the heel of your hand or knead it lightly), and flatten it into a disk. To make the dough by hand: Put the flour, sugar, and salt in a large bowl. Drop in the bits of butter and, using your hands or a pastry blender, work the butter into the flour until it is evenly distributed. You'll have large and small butter bits, and that's fine -- uniformity isn't a virtue here. 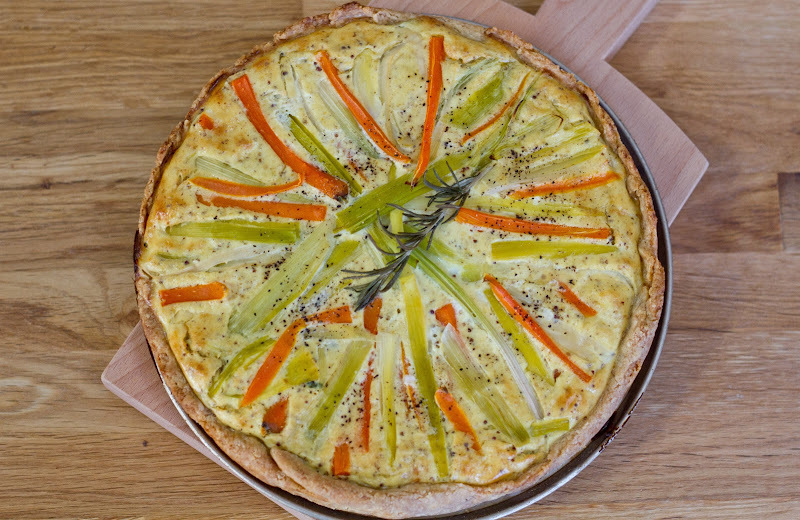 Beat the egg and water together, drizzle over the dough, and, using a fork, toss the dough until it is evenly moistened. 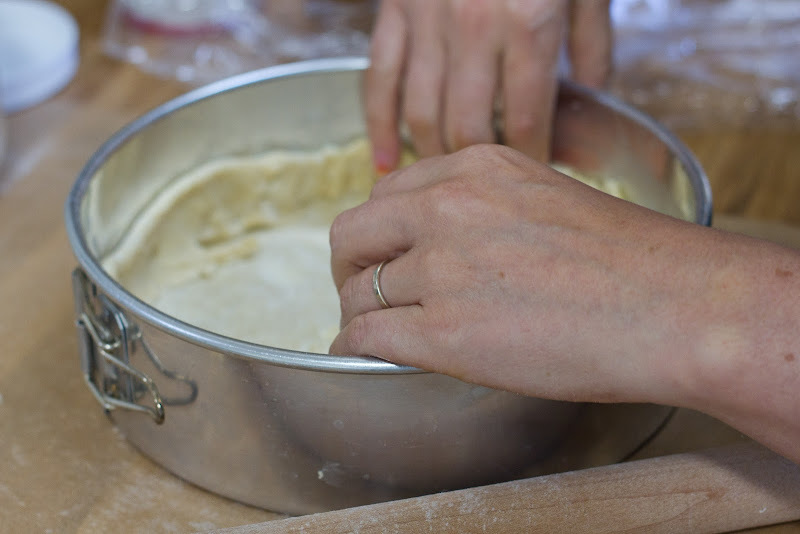 Reach into the bowl and, using your fingertips, mix and knead the dough until it comes together. Turn it out onto a work surface, gather it into a ball (if the dough doesn't come together easily, push it, a few spoonfuls at a time, under the heel of your hand or knead it some more), and flatten it into a disk. When you're ready to make the tart shell, butter a 9- to 9 1/2-inch fluted tart pan (I used a regular springform pan) with a removable bottom (butter it even if it's nonstick). Roll out the dough, making sure to lift and turn the dough and reflour the counter often. The rolled-out dough should be about 1/4 inch thick and at least 12 inches in diameter. 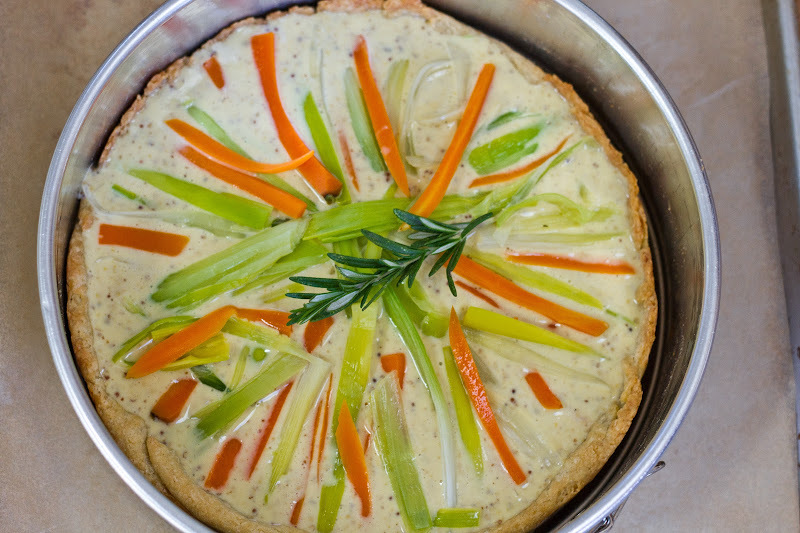 Transfer the dough to the tart pan, easing it into the pan without stretching it. (What you stretch now will shrink in the oven later.) Press the dough against the bottom and up the sides of the pan. If you'd like to reinforce the sides of the crust, you can fold some of the excess dough over, so that you have a double thickness around the sides. Using the back of a table knife, trim the dough even with the top of the pan. Prick the base of the crust in several places with a fork. Chill or freeze the dough for at least 1 hour before baking. Center a rack in the oven and preheat the oven to 400 degrees F. Press a piece of buttered foil (or use nonstick foil) against the crust's surface. If you'd like, you can fill the covered crust with rice or dried beans (Dorie says the beans will be inedible after this but I used lentils and then totally made a soup with them.) to keep the dough flat, but this isn't really necessary if the crust is well chilled. Line a baking sheet with a silicone baking mat or parchment paper and put the tart pan on the sheet. Center a rack in the oven and preheat the oven to 425 degrees F. Line a baking sheet with a silicone baking mat or parchment paper. 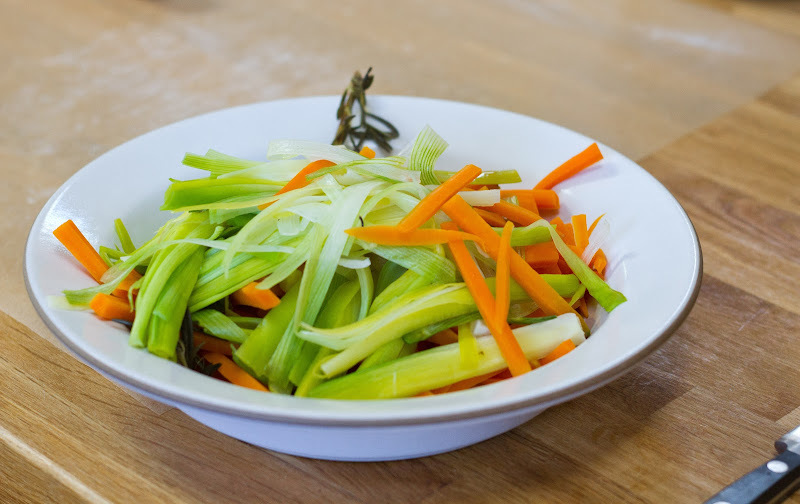 Cut the carrots and leeks into slender bâtons or sticks: First cut the carrots lengthwise in half, then place the halves cut side down on the cutting board and cut crosswise in half or cut into chunks about 3 inches long. Cut the pieces into 1/ 8- to 1/4-inch-thick matchsticks. If your carrots were fat and you think your matchsticks don't look svelte enough, cut them lengthwise in half. Cut the leeks in the same way. In a medium bowl, whisk the eggs together with the creme fraîche or heavy cream. Add the mustards, season with salt and white pepper -- mustard has a tendency to be salty, so proceed accordingly -- and whisk to blend. Taste and see if you want to add a little more of one or the other mustards. 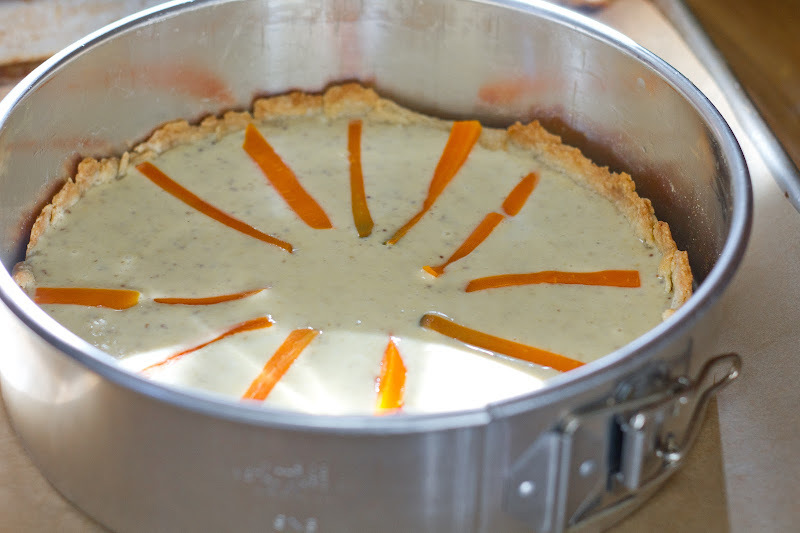 Put the tart pan on the lined baking sheet and pour the filling into the crust. Arrange the vegetables over the filling -- they can go in any which way, but they're attractive (They sure are!) arranged in spokes coming out from the center of the tart. Top with the remaining rosemary sprig and give the vegetables a sprinkling of salt and a couple of turns of the pepper mill. Wow! Good luck with your book proposal! Can't wait to see all the recipes you have earmarked to share. Hooray to lunch on French time! Btw, its really really weird seeing my own hand on the interweb, looking decidedly more old than I actually picture my own hand. But, the tart was delicious, the company was better, and I'm glad Matt got to taste the tiny bit I left :). What kind of gluten-free flour did you use? I'd love to know, as I've recently ventured down that high-maintenance path. Your crust looks gorgeous. Also, boredom and droning is a heavy thing, and I'm glad I'm not alone battling it. A Bon Appetempt book would be amazing! And thank you for this mustard tart. I love mustard, but I didn't know there was a whole tart out there celebrating it. Can't wait to see what else you've got for us. I would totally eat this, especially if I was bored. Going to check out Heidi's farro and lentil soup NOW. Dude, I'll so buy your book. Hi K! Good luck going gluten-free! For baking cookies, add white rice flour. For cakes, add about half the weight in cornstarch and an extra tsp baking powder. It doesn't do perfect cakes but when you're craving it it works in a pinch. " Such a beautiful post, Amelia! I can't wait to read your book. Whoa. That tart is GORGEOUS. And I second Sara in America - can't wait! I like when you mention podcasts because I often take a listen! I heard "Mapping" the other night and your comments about it resonate with me. And I really appreciate your thoughtful writing - it inspires me try harder with my own (SO not naturally inclined). Amelia -- you're a wonderful writer and of course will write a great book. But there are SO many cookbooks from food bloggers out there already, and what you have what probably no one or very few others do is your camera presence! You are so natural on camera, so hysterical, and you and Matt are such a great team, I wish you would try for a tv show in addition to/instead of a cookbook. Just a big fan's unsolicited advice. "Mustardy" is just about my favourite savoury flavour -- never thought of capturing it in tart form! Totally veganizing this and making it tonight!! In the kitchen, I stubbornly eschew appliances (except for a fancy blender, which I sometimes guiltily don't know how I could live without). To me there is something non-boring & very comforting about the fact that with a bowl, whisk, spatula and knife I can make just about anything. Podcasts though, those are definitely in my "keep" pile of technology! wow, this looks and even tastes wonderful from here. That tart looks like an exploding consciousness! I want a book by Amellia Morris in my hands. Like, bad. awwwww. Thanks for the encouragement, Kelsey!!! looking forward to the book and this tart sounds very yummy. 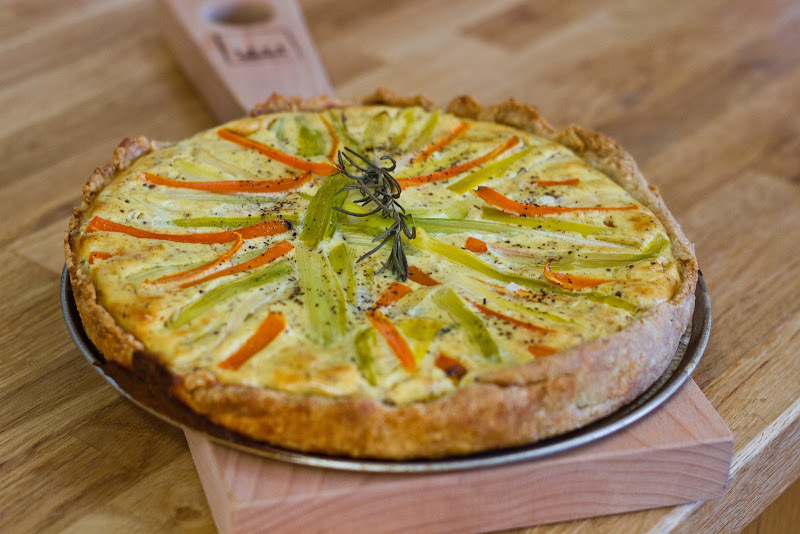 We tried to make this once but I guess our tart crust had some holes or wasn't high enough up the tart pan. In any case, the custard leaded all over the oven and I'm pretty sure we ended up ordering a pizza. It was a Bon appe-fail, which was so sad as I love Dorrie! Maybe I'll give it another shot!